Square dance instruction can come in the form of a live class or a DVD, though live classes will be much easier. Why? Well, square dancing involves quite a few couples, so unless your living room is massive (as well as your television), it'll be difficult to get real practice in. Square dancing is a form of folk dancing that involves four couples. Together, they make a square; separately, each couple makes up one side of the square. Steps are called out from a separate individual while the music plays. 4 couples made up of a "boy" and a "girl." The members of a couple are each other's partners. Each person has a "corner," which is the man to a lady's right or the lady to a man's left. Each couple is labeled 1, 2, 3, or 4. Each couple determines their number based on where they are in relation to the caller. The closest couple is 1, then the numbers go counterclockwise from there. Couples 1 and 3 are heads and couples 2 and 4 are sides. Listen to the caller and switch up the position of the square. You won't always have to be with your original partner, so don't be shy! Don't forget your original assignments (corner, head, side, couple number, etc); you'll respond accordingly throughout the dance, no matter whom you're standing beside. In order to follow the caller's commands, you'll need to learn a few terms. Do sa do: This is the one most people associate with square dancing. But what does it mean? The end result is the same as the beginning one. Facing partners move toward each other and to their partner's right side. Without turning around, they pass each other's backs and come up on their partner's left side. They then return to the facing position. Swing: Another common phrase when it comes to square dancing is "Swing your partner!" That means for the man and woman to hold hands-the lady's right and man's left. The man puts his right hand on the small of the lady's back, and the lady puts her free hand on his shoulder. The couple turns clockwise and, at the end of the turn, drops the original hand hold in favor of a man's right and lady's left hand holding combination. The ending position consists of the lady and the man facing the same direction, holding hands in the middle. Bow to your partner, bow to your corner: Here, you won't change positions at all. This command often comes at the beginning of the dance. It is exactly what it sounds like-men bow to their partner and corner and ladies curtsy to theirs. Forward and Back: This one can be done by a single pair of dancers or two couples. The move consists of three steps in (all dancers involved) and three steps back out-with a pause in between. Single dancers don't touch the other single dancers when they get to the middle of the group; couples that are holding hands will touch outside hands with the other couples when they meet in the middle. You can get some square dance tips from DVDs. Here are a few to get you started: Active Videos has a surprising selection. DVDs are $29.95. You can also buy the CD-ROMS with the music as well as a printable guide. The CD-ROMs complement the DVDs and cost $19.95. The United Square Dancers of America will help you find lessons in your area so you can get help from live teachers. There's really no better way to get square dance instruction. 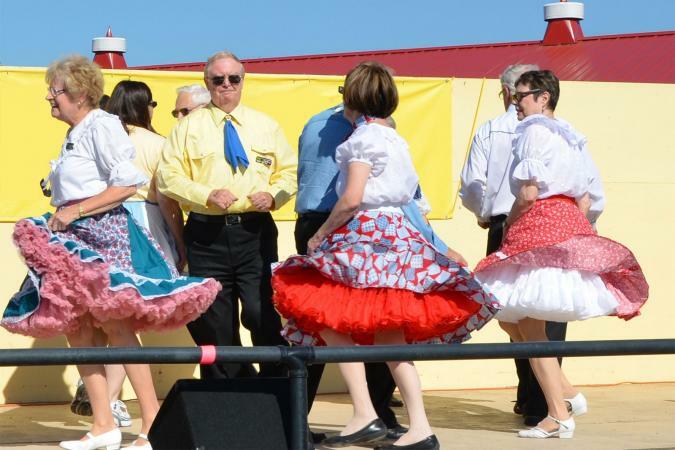 Single Square Dancers aims to promote square dancing to single adults. Highlights include their annual Dance-A-Rama and member scholarships. Dosado.com provides an endless supply of square dance information.